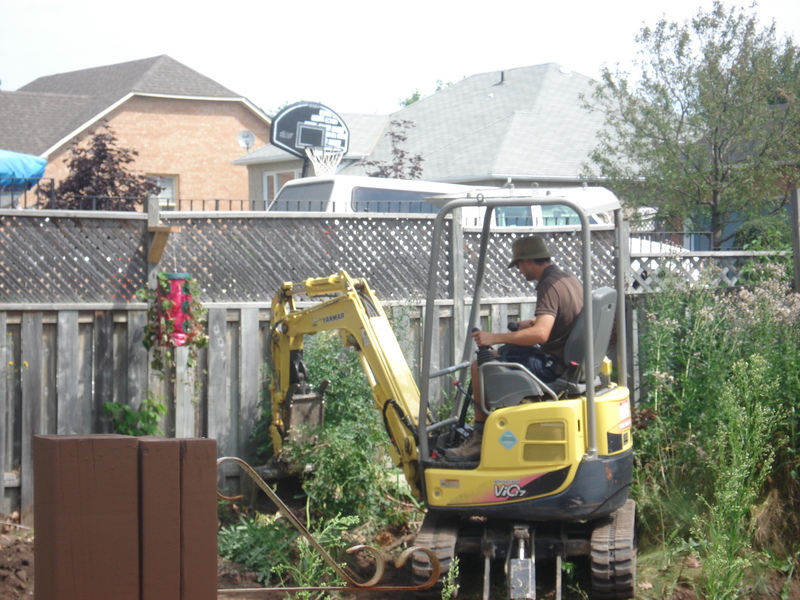 A big renovation… in my own backyard! It was a project long overdue. My own backyard had been horribly neglected since we purchased the house 2 years earlier. The only existing features were a wood deck (slightly rotten) but only large enough for a BBQ and 4 chairs, but no table. A small aluminium shed filled the side yard but was so low that water drains into it every time it rains. A dead sour cherry tree is a horrible eyesore and detracts from the existing pear tree and large Serbian spruce. The lawn was a mess, with more weeds than grass, likely due to the poor quality of the topsoil. Although not as noticeable to the untrained eye, there are also major drainage problems in the yard causing water to pool near the foundation and the sump pump to run frequently. With limits being placed on the availability and selection of pesticides for turf, the health of your lawn becomes of utmost importance. However, it is very difficult to diagnose problems in your lawn without an evaluation of the soil conditions beneath it. Nutrient shortages, such as nitrogen or magnesium, can have significant impacts on the health of your lawn, but can be easily treated once discovered. The easiest way to determine nutrient deficiencies and other soil problems is with a soil test. Internet soil tests are available, but to simplify the process, RHPL is offering spring soil tests for our existing clientele. For only $39.95 + GST, we will come to your property, take multiple soil samples, and submit them to a lab for testing. You will have results within two weeks which will provide further information on any soil deficiencies which could be leading to poor turf health. You will also have the option to select turf treatment and amendments which applied through the year, will remedy any problems. For more information or to sign up for a spring soil test, contact us at soiltest@ryanheath.com. For anyone living on the south side of their street, the existence of an icy front walkway can be a daily frustration. Ice from freezing rain of the melt and refreeze of snow can make your front walkway and steps treacherous. Here is a bit of the science of the most common cure to ice: rock salt. Rock salt, known scientifically as sodium chloride or halite, is the most commonly used ice melter in North America due to its prevalent availability and low cost. It provides adequate economical performance at temperature close to freezing, but as temperatures drop below freezing, its performance slows substantially. Below temperatures of -8 degrees Celsius, rock salt has little to no ice melting abilities. One surprising fact that very few people know is that salt does NOT melt ice! The way the salt has ice melting abilities is by mixing with available moisture in the air and from snow to create a salt water mixture called brine. This brine forms between the ice and the pavement (or walkway/concrete) and initially breaks the bond between the ice and the pavement allowing the ice to be more easily removed by plowing or shoveling. Over time, the brine will continues to melt the ice from the bottom until either the ice is gone or the concentration of salt in the brine is too low to be effective at the current temperature. When the concentration of the brine gets too low, there is also a tendency to experience re-freeze, where the brine itself will turn to ice. Along with the dangerous effects that re-freeze can have (sometimes resulting in glare ice or conditions similar to freezing rain), rock salt also has toxic effects on plants and can cause damage to uncured or low strength concrete. On a larger scale, the road salt used in plazas, on municipal roads and on provincial highways has huge impacts on ground water and lake salinity. This is a huge environmental issue but due to the liability of not using salt (auto accidents, slip-and-fall accidents) its use will continue until a suitable replacement is found. There are many alternatives to rock salt that can be considered. Calcium chloride and magnesium chloride on their own, or mixed with rock salt are excellent de-icers that melt ice faster and at lower temperatures and are readily available at all the home stores. Many ‘enviro’ de-icing products exist that are less toxic to plant material (and the environment) than rock salt, but some only marginally. One of the most environmentally friendly options to deal with ice (aside from wearing skates) is to spread pickled sand on the area to provide traction and some minor melting. Pickled sand is sand that has been treated with a small amount of deicing agent (sometimes salt) to keep it from freezing in the winter. You will have a bit of a sandy mess to clean up in the spring, but at least your walkway/driveway/parking lot will be safer. The best way to reduce the buildup of ice is to remove snow promptly after a snowfall. Also, spreading a small amount of de-icer before a large snowfall will make it easier to shovel/clear/plow right down to the bare pavement/concrete. With the holiday season sadly behind us, many of us are packing up decorations and putting our large pine scented ornament to the curb for pickup. The last thing many of us are thinking about is our landscaping. It’s often hard this time of year to even see much of our property since it may be dark when we leave our house in the morning as well as in the evening when we return. 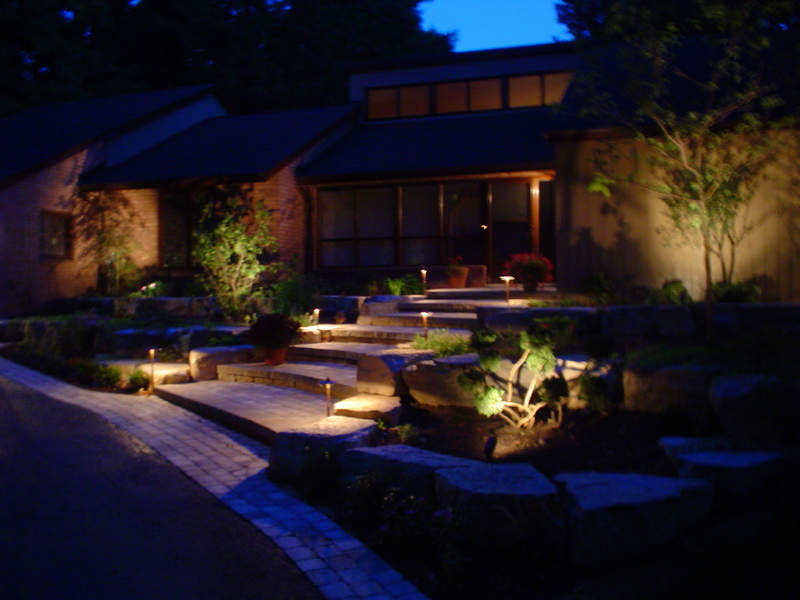 This time of year, it would certainly be much easier to appreciate the landscaping on your property (as well as increase the safety around your home) with the addition of a landscape lighting system. Landscape lighting is great in the summer, providing a warm glow and extending the use of your outdoor spaces later into the evening, but it can also be quite beautiful in the winter, illuminating the snow covered branches of an ornamental tree. Even if you are unsure of the potential benefits of having a lighting system installed, don’t hesitate to contact us for a free lighting demonstration on your property. We are happy to offer free lighting demonstration for all our existing customers. A lighting demo involves a temporary installation of a transformer and light fixtures. All wires are left exposed and fixtures are installed in the ground or temporarily hung where needed. The demonstration will included different types of fixtures such as up lights, down lights, path lights and wall washes. In some situations we will also setup different style fixtures such as copper, stainless and black path light fixtures. You decide on the area you are most interested in lighting (front yard, side yard, and backyard) and we setup a demonstration using the appropriate fixtures to create different lighting effects. You will have the opportunity to see the lights in action for at least 2 nights before we come to take the demonstration down. You will realize very quickly that certain fixtures and certain effects will be very functional in your space and bring out the beauty of your landscape at night. Most of the fixtures we install are solid metal fixtures made of copper, bronze or stainless steel and come with 10 year warrantees. Depending on the lamp used in each fixture, low voltage will typically use about a quarter of the energy that a typical hardwired fixture would. Also, low voltage installations are much safer than hardwired installations because the elimination of any chance of electrocution. Functionally and esthetically, low voltage fixtures reduce or eliminate the problems associated with the glare caused by larger hardwired installations since the lamps are hidden and generally provide indirect light that doesn’t washout the entire landscape. From your preferences we can prepare a quote giving you the Good/Better/Best options based on your needs. The lighting demonstration is a no obligation, free service we offer to our clients. But be warned, once you and your family live with the benefits of landscape lighting for a few days, you’ll wonder how you got by without it. Wet conditions around your foundation and your hardscapes can lead to heaving over the winter. There certainly hasn’t been a shortage of rain this fall. This should prove to be beneficial for most of the plants in your gardens. Plants need an adequate supply of water in the fall so that they aren’t susceptible to desiccation (drying out) in the winter winds. On the other hand, the last place we want water is near the foundation of your house, under walkways or patios, and behind retaining walls. Water near your house foundation is mainly a concern in areas with clay subsoils such as Newmarket and Keswick. In these areas, as the frost penetrates into the ground, the wet clay freezes, expands and grips on to the foundation walls. This often leads to upward heaving of the garage foundation and a zig-zag of cracks through the brick work where the garage and house join. In walkway areas, freezing can cause the ground to heave over the winter. In the spring, the ground often settles in unpredictable ways causing the need for the interlock to be lifted and relayed. Other surfaces such as stamped concrete may need to be completely redone if winter heaving is too extensive. Retaining walls are also very susceptible to wet conditions before winter. As water in the soil freezes, it has sufficient strength to push any retaining wall forward by at least a few inches. This forward movement, over time, can eventually cause any retaining wall to fail. So with all these impacts that wet fall conditions can have, there must be something we can do to prevent it all. To protect your house (likely your biggest investment) you need to direct water away from it wherever possible. Downspouts that drain water off the roof should empty at least 10 feet away from the foundation. This can be accomplished easily by piping the water (in solid ABS or PVC) underground so that it empties in the lawn or garden. All surfaces around the perimeter of the house should have at least 2 percent slope (1/4 inch of slope for every foot) to move surface water away. To protect patio areas from heaving, the surfaces should have sufficient slope to move water away (2%). To limit the water infiltrating through the surface and into the base material, polymeric sand can be used. It almost eliminates water infiltration for the first few hours of rain keeping the base material nice and dry. To protect against heaving, we at RHPL use a cementicious base material called Ultrabase underneath all our interlock and steps. The Ultrabase resists heaving and settling, eliminating the chance of having small problem areas that need to be repaired). To protect retaining walls from being overturned by frost heave we need to remove excess water that can accumulate behind the wall. This is done by using clear gravel and a perforated plastic pipe to drain water and increase air flow. Water is able to drain through the front of the wall and through the pipe, leaving the dry gravel which will not heave when frozen. The effects of frost heave can be significant and quite devastating, but by dealing with all the wet conditions that fall brings, we can prevent any damage from occurring, so that the spring isn’t accompanied with nasty surprises. Little time left to get it all done! Fall is certainly a busy time of year in any garden. Timing is very tight between when all the leaves have dropped and when the snow is here to stay. You need to keep on top of it all or risk having a real mess to clean up (and potentially losing some plants if it is a particularly harsh winter) in the spring. By now you should have removed all your annuals and emptied any hanging baskets or urns. All vegetables gardens should be cleared as well as any dead material on perennials that have been hit by frost. Keeping up with the falling leaves is an obvious struggle. Now is a great time to plant fall bulbs. Some retail centres may have bulbs on sale as it is now pretty late in the season. Evergreen shrubs and hedges should be trimmed one time before winter. Planting of trees, shrubs and perennials can still be done with great success. The plants will be dormant until the spring and will start growing in your garden before you would have been able to purchase them at a garden centre. For you lawn, it is a great time to seed or lay new sod. Seed that doesn’t germinate now will stay dormant and continue germinating in the spring. Now is also a great time to fertilize your lawn and to spread weed inhibiting products such as corn gluten. Protect tender plants such as roses with a mound of peatmoss, mulch or leaves. Evergreens in open windy areas can benefit from wrapping or screening in with burlap. Make sure to attend to all outdoor water taps. Remove and drain hoses and shut off water supply unless the tap is a freeze proof hose bib. With lots of work now and a little bit of luck over the winter, your garden will have a headstart in the spring.